Thanks so much for hosting me here today. The blog train has been a lot of fun and I agree, we’ve got some wonderful books to ponder over here! Your book Wounds is definitely on my must buy list! Thanks again and a big hello to all our visitors! 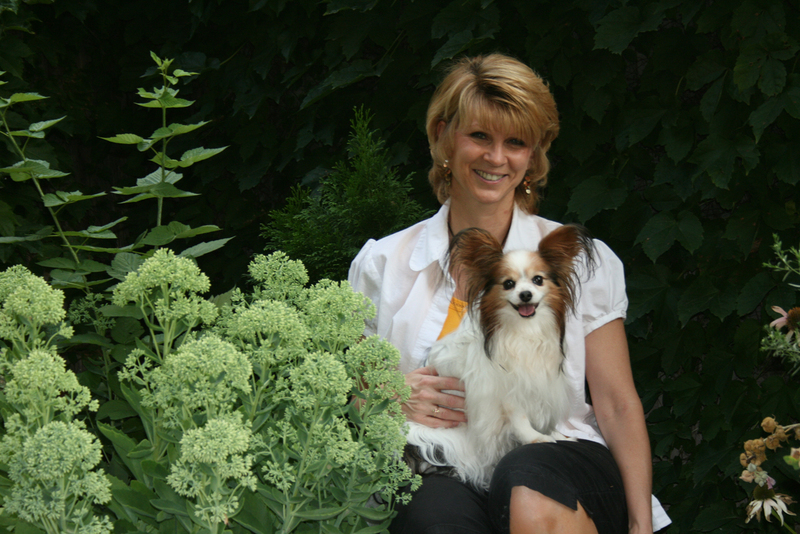 C. K., Thanks for sharing the photo of you and your beautiful Papillion. I’m sure your pups bring a lot of joy into your life. No doubt you are already into another work in progress. 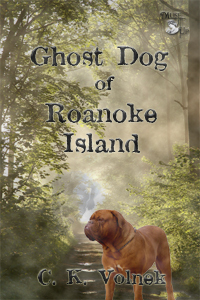 We’ll be looking forward to whatever that might be as much as the Ghost Dog of Roanoak Island. I’m almost sad to see this intense month come to a close. It’s been great getting to know you and the other Muse authors. I had so much rather read books for young adults than for adults. Your book sounds really interesting, I love stories based on real happenings. What is your little papillions name? In the interview you said that there was a mastiff in the story, do you have big dogs too? Did you use any of your past or present pets as models for the dog characters in you book? Congratulations on your new book coming out! What piqued your interest in the Lost Colony? A dog in the middle of a mystery story–how wonderful is that! I’m a dog lover who’s also into mysteries so I can hardly wait to read this story! Hi Jessica, Justin, and Anita — you know what actors say about making a movie with dogs or kids. Don’t. They will upstage you every time. I think Charlie (C. K.) has a winner with that big dog. Charlie, love the book. We have border collies and labs. Would love a copy of your book! Well, my 8 year old son would love it even more! I recently read a book about the lost colony. It’s fun to learn the facts known about it & let your imagination fill in the holes., Good luck with your book. What a simple and sweet interview. Good to know more about you. I will gift this book to my daughter. She loves dogs and ghosts…I’m sure she will love your book Keep writing and we will read. Barbara, thanks a bunch for bringing Charlie on the board. Hey! Love your blurbs and exerpts you’ve been sharing on this tour! Sounds like a great read. Hi Pam, J. Aday, Priya, and Elizabeth. Thank you very much for dropping in and leaving comments. Charlie, this is one book that appeals to many generations. Jessica – this little Paps name is Sally. We have four of them. Used to have a Golden Retriever and she was the best dog ever. Love dogs of all colors and sizes. Anita – Thanks so much for stopping and leaving me a comment. Pam – Border Collies and Labs are great dogs. My son has a border collie and she is the best pup! J Aday – It is fun to let your imagination run wild. Thanks for stopping. Priya – Thanks for the lovely comments. So wonderful to meet and greet new friends. Elizabeth – Thanks for the note. Glad you liked the excerpt. It was a fun book to write. Thanks to everyone for stopping by. Again, thanks to all and good luck in the contest!